This family is our third generation of data acquisition modbus RS485 modules for industrial environments. This modules facilitate the work in installations by keeping the inputs/outputs separated from communications and power supply. 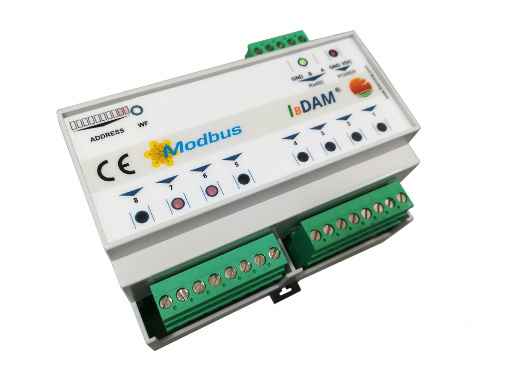 In the same bus you can mount up to 128 modules, but we recommend building small electrical boxes and when possible using one RS485 line for every 32 elements. This can be achieved with our IB RS485 – Ethernet adapters. Standard size which allows them to be mounted in electrical boxes type “domestic”. (Each module takes up 6 spaces in the electrical box). All-over encapsulation which avoids access to the electronics, maintaining the plug-in terminals. Status display by visible LEDs in the front. These LEDs give information about the state of the module, the communications and the inputs/outputs. Power supply at 24 DC for all the modules connected in the net. The inputs/outputs have been improved. More power and resolution. The embedded firmware has again been improved, allowing more flexibility.